October 25, 2011 - Piper Aircraft is indefinitely suspending further development of the Piper Altaire business jet following a review to align the company’s business goals with the light jet market outlook, investment strategies and overall economic forecasts. Caldecott said that while the Altaire program was on schedule, on budget, and hitting aircraft performance targets, planned development costs had risen above the point that were recoverable under foreseeable light jet market projections. The company will not release the budget for the Altaire development program or expenditures to date. Piper will refund the deposits of Altaire position holders or their deposits can be applied towards other new Piper airplanes. “Clearly, the market for light jets is not recovering sufficiently and quickly enough to allow us to continue developing the program under the economic circumstances we face,” Caldecott said. Among the enterprise initiatives underway is Design by Piper. This third-party service provider will perform proprietary engineering and technical functions for other companies to take advantage of the high level and wide range of some of the talent that had been assigned to the Altaire development program. Additionally, Precision by Piper, another third-party service provider, will leverage the company’s precision manufacturing expertise and recent upgrades to its manufacturing capabilities which were completed in anticipation of Altaire production. Utilizing the company’s vertically integrated manufacturing model, Piper is also stepping up product improvements and investments in existing lines of its business and training aircraft. Caldecott said, “Without a doubt this event will impact the company, but Piper employees have demonstrated great resilience before to overcome such economic obstacles and I am confident we will once more persevere over the long-run.” Deliveries of Piper's piston and turboprop powered aircraft have increased quarter over quarter and year over year as the company continues to outperform the marketplace, meeting or exceeding internal financial and delivery targets. Piper is preparing a schedule of personnel reductions and will provide information to the affected employees as soon as possible. The company will aggressively work with aviation companies and other employers who are currently seeking talent to place as many impacted Piper employees in other positions as possible. Current employment at Piper totals more than 850 individuals. As a result of the indefinite suspension of the Altaire jet development program, the company will progressively lay off approximately 150 employees as the program ramps down. That will bring total company employment to somewhat more than 700 individuals. In addition, the company is quickly eliminating the positions of 55 contract personnel. 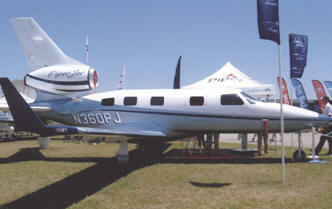 The Piper PiperJet Altaire was to be a single-engined very light jet (VLJ), designed for single-pilot operation. It was based on the PA-47 PiperJet prototype, the Altaire was to feature a slightly larger fuselage with a rounded cross-section, which would have included a conventional control yoke for flight control, as opposed to the original PiperJet's side-stick controller. The Piper Altaire was to be built in Vero Beach, Florida (USA) The first delivery of thee aircraft was scheduled for 2014. Back on the 17th Piper appointed Simon Caldecott as interim President and CEO of Piper Aircraft after reviewing the Altaire Program. Caldecott had joined Piper in 2009 and as Vice President of Operations responsible for Manufacturing Operations, Manufacturing Engineering, Quality and Supply Chain. Caldecott replaced Geoff Berger, who joined as the previous interim CEO in mid-2010. Executive Vice President Randy Groom was also let go.